The three-year Concept Development and Experimentation Phase of the Slovak Republic’s Prokrocily Individualny Bojovy System (PIBS) or Advanced Individual Combat System was completed in 2007, following trials of an experimental ten-man squad. A new, follow on phase over the next two years, this time based on the Elbit Systems’ Dominator system began earlier this year. 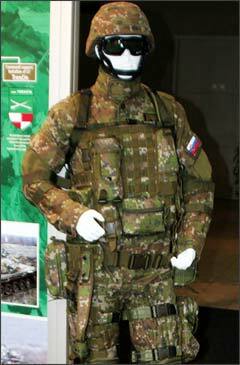 A new Slovak uniform began being issued earlier this year, which uses a digital camouflage developed by the Armed Forces Academy and optimised for effectiveness at 40-50m. It is estimated that conversion to the new uniform which is 15 percent cotton and 85 percent polyester, will be completed in the next three to five years. The uniform, which is produced in beige and temperate colour schemes, is first being issued to troops deployed overseas. The uniform consists of a blouse and trousers. A modular carriage system is also being issued which has 30 litre or 60 litre options. The uniform has no capabilities to reduce the wearer’s thermal signature although in a separate effort, the Academy is developing a uniform material with these characteristics. The earlier PIBS trials used a solution similar to the initial Infanterist der Zukunft suite, using a Personal Digital Assistant (PDA) display. Slovakia however, is now pursuing different options. “We are co-operating with Elbit with some modifications to the Dominator system,” explained Uherik. While the 2007 trials concentrated on light, dismounted troops, the next test phase will focus on integrating the squad with mechanised platforms. As well as new equipment, for example replacing the SOLAR 400E radio and audio ancillaries with Elbit’s PNR-500, other changes are less to do with equipment but more to do with the lessons learned for the overall approach to the delivery of soldier modernisation. “We are preparing a mechanised squad. The squad leader has a computer with a display in the AFV but hunter killer teams for the dismounted part the squad won’t use a display, and only the platoon leader has an eye piece display.” This however, isn’t set in stone and in some situations the squad leader will have a display. In the 2007 trial, the Ministry used new 5.56mm weapons; the Heckler and Koch G36, with the AG36 40mm grenade launcher and the MG4 Light Machine Gun. These were supplemented by the legacy vz.58 assault rifle. In the new testing phase, Slovakia is going to only use its existing weapon systems. Uherik said, “There were some problems with weapons [used in the first trial] because some 5.56mm weapons are very expensive.” He believes that a programme to replace the current weapon systems will nonetheless start no earlier than 2011. As part of the trials PIBS used Simrad sourced image intensification goggles and thermal sights from Sagem, the latter issued on the basis of one per squad. After the two year trials are completed, the plan is to move to the procurement of sufficient PIBS ensembles from 2012, to equip a single three battalion brigade plus supporting units, roughly 2000 systems in total.